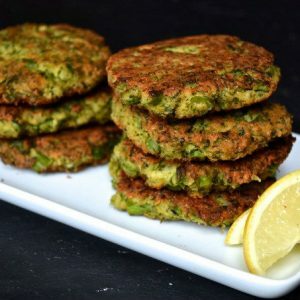 These delicious and easy to make tikkis make a perfect starter or evening snack. Made with grated zucchinis, mashed potatoes and spices, they are best served with chutney or sauce. 2. Saute the garlic cloves for 10 seconds. 3. Add the grated zucchini and saute for a minute. 4. Add salt and saute for another minute. 5. Add the mashed potatoes to a bowl. 6. Add the zucchini mixture, red chilli powder, cumin powder, garam masala powder, chaat masala powder, coriander leaves and half of the breadcrumbs. 8. Shape the mixture into small/medium balls and flatten them like a cutlet. 9. Dredge them in the remaining breadcrumbs. 11. Shallow fry the prepared tikkis until crisp and golden brown. 13. Sprinkle a bit of chaat masala powder. 14. Serve with sauce or chutney of choice. 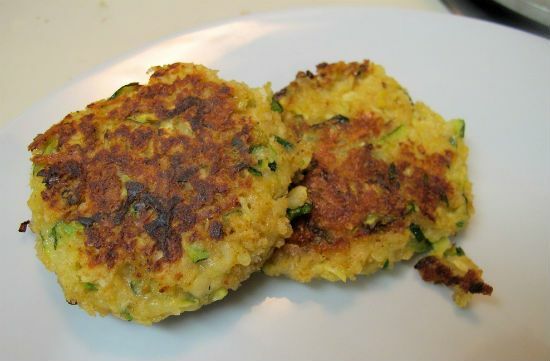 Feel free to comment or share your thoughts on this Zucchini Tikki Recipe from Awesome Cuisine.